Welcome to the home of Scarteen on the Internet! Scarteen House has been home to the Ryan Family since 1798. Set in the heart of the Golden Vale on the Limerick/Tipperary border, today the name is renowned in equestrian circles as a first class competition and training venue. 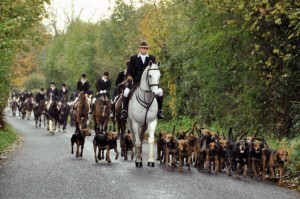 Scarteen has long been synonymous with Hounds, Hunting and hospitality. 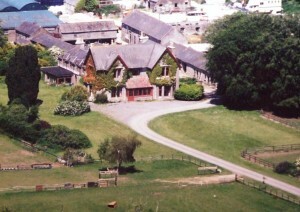 When Thady and Anne Ryan retired to New Zealand in 1987, Chris and Sue took the reins and have maintained this tradition. The Scarteen (Black and Tan) Hounds have been in the Ryan family for over 350 years and attract visitors from all over the world. The hunt has featured in many publications (magazines, books, films etc.) over the years and more recently, Michael MacEwan dedicated a book to the Scarteen history. Thady’s autobiography “My Privileged Life” was published in 2002. Sue and Chris have been producing young event horses since 1990. Scarteen graduates are now competing successfully worldwide. A facility has been developed whereby carefully selected horses can enjoy a tremendous introduction to a serious eventing career. In 2001, a Derby Track was designed and built and since then this has been home to an annual Future Event Horse League Qualifier as well as numerous other competitions and clinics.